Phil Richardson had not noticed his sight start to deteriorate. 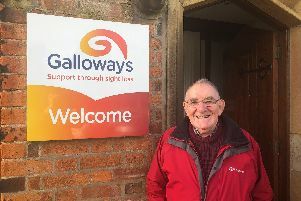 A project manager with a leading local sight loss support charity is backing the global campaign for greater awareness of glaucoma – and calling for more of us to halt the sneak thief of sight through a simple eye test. Phil Richardson, 60, who works for N-Vision, the Blackpool Fylde and Wyre Society for the Blind, was diagnosed with glaucoma 22 years ago. His work takes him out into the community helping others, whether it is with their benefits raising awareness. He also runs the charity’s network of café clubs to curb social isolation. Phil admits that if his wife Mary hadn’t noticed him squinting when reading he might have never visited an optician for a sight test. 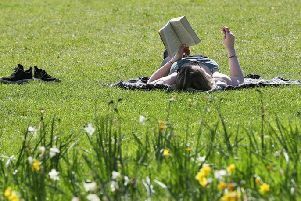 Too many turn what could become a blind eye to glaucoma, one of the most common causes of avoidable sight loss in the UK. Mostly associated with the build-up of fluid leading to high pressure in the eye, it affects around 70m people worldwide. Left untreated it can damage the optic nerve, leading to sight loss. Advanced, it’s irreversible. It already affects more than 500,000 people in the UK. Few realise they are developing glaucoma because there are no early symptoms. World Glaucoma Week is out to raise awareness. N-Vision supports several thousand severely sight impaired (blind) and visually impaired people across all three local boroughs. Many have glaucoma. Phil stresses that a routine eye test could spot the signs of glaucoma faster. First line treatment usually takes the form of eyedrops to reduce the watery fluid in the eye. If the drops don’t work – or glaucoma is more advanced – laser surgery can improve the drainage channels. Surgical intervention often takes the form of a trabeculectomy – which creates a small flap on the top of the eyeball with a drainage hole beneath to allow fluid to flow out. Phil required incisional surgery in one eye. Within six months he had a trabeculectomy to lower the intraocular pressure, surgery with a high success rate. Phil has also been on a range of eye drops. Last summer he had two further procedures under local anaesthetic. He’s just been told he will be able to stop the eye drops next month. “I’m thrilled,” he admits. “It will be the first time in 22 years that I won’t have to take them. If you’re diagnosed you must be vigilant with your eye drops and use them as prescribed. “Glaucoma creeps up on you. “I’d not noticed any changes in my sight and by the time I saw an optician I’d already lost some of my peripheral vision without realising. I can’t stress how important it is to have regular eye tests. “You may need to make some changes in your lifestyle but it’s worth it. Phil is hopeful of new treatments in the future. In the last 22 years he’s seen drug advances and less-invasive surgical procedures. Much of the new thinking is around faster intervention and early stage therapies before a visual field test detects impaired vision, in order to rescue and repair nerve cells. A recent trial looked at neuro-regeneration rather than protection. N-Vision’s eye clinic liaison officer Linda Sethi, who divides her time between the charity and Blackpool Victoria Hospital, was able to apply her expertise to assist a friend. “Phil’s an amazing colleague,” she said. “This is part of it – don’t let glaucoma steal your way of life. We have many clients who have glaucoma and we are here to support them. “World Glaucoma Week and national events are essential in raising awareness of the importance of taking care of yourselves. Glaucoma is more common than many realise. “You are more at risk if a close blood relative already has glaucoma, if you are diabetic or if you have used steroids for a long time. “Glaucoma affects your peripheral vision first, which is the vision to the sides and up and down, what you use for getting around without bumping into things or missing that bottom step off the stairs. Glaucoma can lead to permanent loss of vision if it isn’t diagnosed and treated early. “If you do notice any symptoms these may include blurred vision or rainbow coloured circles around bright lights. “We all lead busy lives and our health is so important. Taking just half an hour to see a high street optician is something we should all be doing. “Your eyes are the window to your soul as so many other health conditions can be detected such as high blood pressure and high cholesterol. Anyone who is newly diagnosed and would like further information or support can contact the Low Vision Centre on (01253) 362696.